This Nickelodeon series was created by Mitch Schauer. It follows the lives Daggett and Norbert Beaver, two young beaver brothers who have left their home to become bachelors in the forest near the fictional Wayouttatown, Oregon. 3.5/5 Stars from 7 users. Please give the Cartoon Series The Angry Beavers a vote between 1 and five stars, with five stars being the best, 1 being a show you absolutely hate, and a three for an average show. This Series has been viewed 3 times this month, and 8,472 times total. 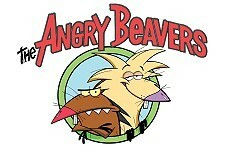 The Angry Beavers Episode Guide -Nicktoons Prods @ BCDB by Big Cartoon DataBase is licensed under a Creative Commons Attribution-NonCommercial-ShareAlike 4.0 International License.